In 2018, the phrase ‘the whole world in your back yard’ takes on new meaning. Reflecting what’s on our minds in the outside world, garden design is adapting with a new focus on wildlife, togetherness and a sense of permanence. More and more in 2018, garden design plans feature a special spot for wildlife, both plant and animal varieties. Traditionally tucked away at the end of the garden, this area is now coming in as a feature. You could give up part of your lawn to create a small pool with a little rustic seat as a place for quiet reflection. You can help by growing both berry-bearing and seed-producing plants to support the local bird population and reduce the use of insecticides to encourage wildflowers. Another trend in line with a love of nature is a new awareness of the purpose of your precious garden space. More than just a showpiece for specimen plants, it’s a space for family togetherness and intergenerational enjoyment. You can encourage this with a garden table and chairs arranged like a living room, complete with a low-level coffee table, not just a more formal dining space. Garden decoration ideas are firmly moving towards a sense of permanence which adds to the aura of tranquility, natural spaces and family togetherness. Use stone and natural wood for features like a fountain or garden bench. Move your dining area away from the house to increase the sense of a separate environment and replace the garden decking with stone paving which will look as though it’s been there forever. Don’t clean the natural lichens that form on the outside of ceramic pots; they add to the sense of discovering a natural setting. Do make sure you test out your design ideas before you start. You’ll find using a 3D apartment plan just as much help for your garden ideas as for the house! Think about the movement of people and views they will encounter and use 3D home design free software to make sure your images of a perfect garden space will look as good in reality as they do on paper. Encourage local wildlife by growing plants that butterflies and bees love, as well as seed-bearing and berry-producing plants that help your local bird population to thrive. Center the area on a small pond to provide a habitat for a wider range of plants. 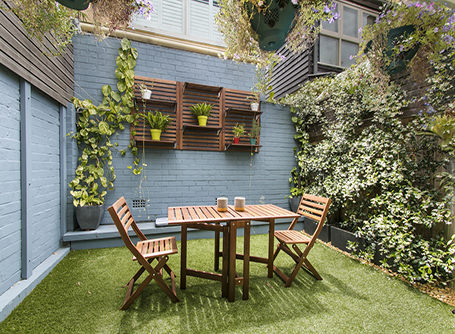 The trend is to think of a garden as a relaxing family space rather than a setting for showpiece plants, so focus on spaces for relaxing, children’s play and informal gatherings. By all means keep your dining area but see if you can create a ‘coffee morning’ alternative space as well. Work on creating a sense of permanence; there’s nothing like a garden where you feel you are discovering a space that’s been in existence for ages. If you ditch the decking, or at least supplement it with a paved area away from the house, you can achieve the effect. Use natural materials for your plant containers to add to the sense of a long-lasting natural space. Terracotta pots left to weather naturally, wooden benches and small sections of log placed as seats for children add to the ambience. Before you start, use a 3D free plan to help you visualize how the space will work. Lots of other likeminded people make use of 3D home design software as well, so you’ll find you naturally pick up some inspiring ideas.